Alex Chalmers, co-chair of the Oxford University Labour Club (OULC) has resigned from office after the OULC decided tonight to endorse Israel Apartheid Week. In his resignation statement he wrote about his concerns, alleging that there were growing anti-Semitic tendencies in the OULC. Chalmers said, “The decision of the club to endorse a movement with a history of targetting (sic.) and harassing Jewish students and inviting antisemitic speakers to campuses, despite the concerns of Jewish students, illustrates how uneven and insincere much of the active membership is when it comes to liberation.” OULC tweeted in response to the passing of the IAW motion, “OULC just voted to support Oxford Israeli Apartheid Week in a continuation of its solidarity with the Palestinian people.” The motion was passed by a close margin 18 votes to 16. The annual series of lectures and rallies against Israeli occupation of the West Bank and Gaza originated in Toronto in 2005 and aims to “educate people about the nature of Israel as an apartheid system and to build Boycott, Divestment, and Sanctions (BDS) campaigns as part of a growing global BDS movement.” It now occurs in more than 55 cities worldwide and is seen by those involved as an opportunity to champion the Palestinian cause and draw attention to the occupation. 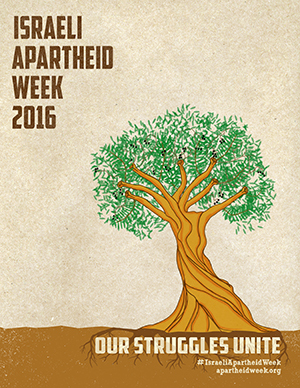 Yet, the Israeli Apartheid Week has also stirred up controversy and accusations of anti-Semitism. Hey, kids, why not "draw attention to" something real for a change? 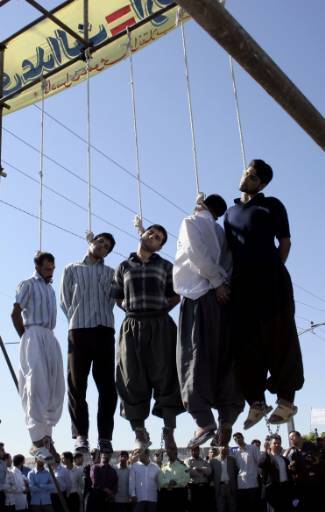 Some suggestions: Iranian Homophobia Week, Syrian War Crimes Week and/or Saudi Arabian Gender Apartheid Week. Don't bother answering. I know those events wouldn't be nearly as satisfying as your "Zio" bash. Update: One final suggestion: Palestinian Misogyny Week. Update: This year's poster would be even more informative/accurate had the word "struggles" been translated into the original Arabic. Our "jihads" unite? You betcha! "All Bound for Morningtown Many Miles Away"
Two Jewish Parents Respond to Zionhass at York U.
Pro-BDS Motion Passes at McGill U. What's Behind Angela Merkel's Refugee Madness? "I Did It For My Country"
Is Obama Implicated in Hillary's E-Mail Snafu? "President Sanders Wasn't Deterred By Mere Math"
"It's Considered Cool to Oppose Zionism"